If you encounter a crochet chart as part of a pattern or design in a book, magazine, or website, the designer has hopefully specified some sort of key to interpreting the chart. You'll often find charts without any kind of key, and if you don't already know what to do with them, that can be frustrating. If you do find a crochet chart without a key, it's possibly because the designer knows that the chart can be used in so many different ways. How to figure out a filet crochet starting chain for any chart. How to do the first row on a filet crochet chart. How to do 3 dc mesh in filet crochet. You could use two-color charts for cross stitching on top of a crocheted background. If that's what you want to do, there are several decisions you need to make. Decide which crochet stitch to use; single crochet and afghan stitch are both good choices, although there are other possibilities. Then decide which color is your main (background) color, and which color on the chart you want to interpret as representing the areas to be cross stitched. You'll want to choose two contrasting colors of yarn, one for the background and one for the cross stitch. You'll have to crochet the entire piece using your chosen stitch and the background color. You'll crochet one stitch corresponding to each block on your chart. When you've finished that, the chart will help you know where to work the cross stitch. In this case, one square in the main color would represent one crochet stitch that remains unworked, without any cross stitching; the other color would represent the areas where you'd cross stitch on top of the crocheted background. With a two-color chart, you only have to cross stitch one of the colors. Of course, if you want the entire piece to be covered with cross stitch, it's an option; you could work cross stitches over the crocheted background if you wish, using either the background color or a third color. It is not, however, necessary to do this. If you want to work cross stitch on crochet, you aren't limited to only using crochet charts; a world of possibilities opens up if you consider all the cross stitch charts available. Connie Barwick has posted many free cross stitch charts in the past that can be helpful for this. If you're looking at a chart that has more than three colors on it, the chart is most likely a chart intended for some sort of color work. You could probably use it for tapestry crochet or cross stitch on crochet. 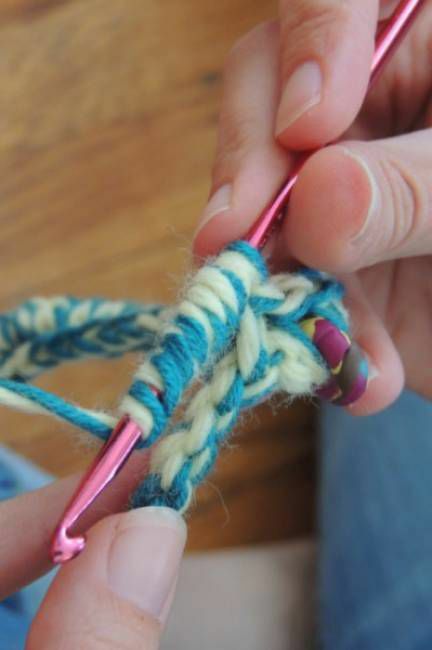 Tapestry crochet is typically worked using single crochet stitch, although this is not the only stitch you could use it with. Unless your pattern specifies otherwise, generally, each color on the crochet chart corresponds to a different color of yarn; each square on the chart represents one single crochet stitch. Since there can be more than one color per row, you'll need to know how to change colors in single crochet stitch. Sometimes, the color changes will happen in the middle of a row. With tapestry crochet, you will crochet overtop of your unused color(s) so they'll be hidden inside the stitches you create using your active color. This eliminates the problem of long floats appearing across the back or front of your work.